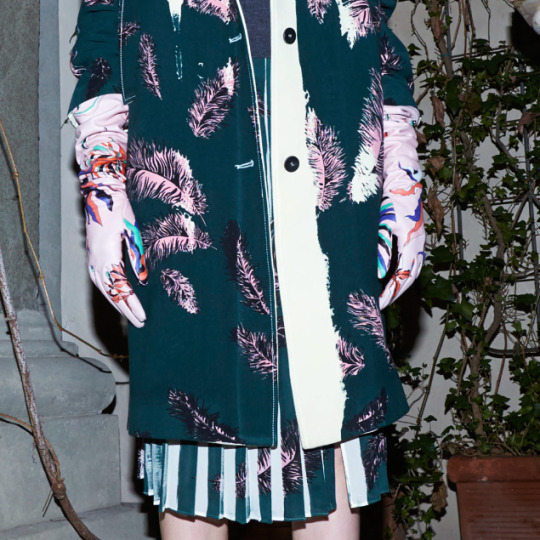 The Autumn-Winter 2015 collection at Undercover was filled with sharp construction details and shattered design lines which were rounded out by rich colours, painted fabrics and voluminous drapes of velvet, satin and jersey. Soft and luxurious fabrics were often layered, deconstructed and then rejoined to create spliced details and staggered panel lines. Darts were often sewn so that the dart value was visible on the outside of the garment, creating pointed wedges of fabric that spliced through the garment at different angles. The pattern pieces that used these darts were carefully balanced so that a symmetrical garment was shaped using an asymmetrical combination of darts and panel lines. For example, on some of the coats there may be a dart on one side of the body, but the same fit value was created on the other side of the body using panels instead. Or at times the dart was removed altogether and the same fit value may have been rotated into an adjacent panel. 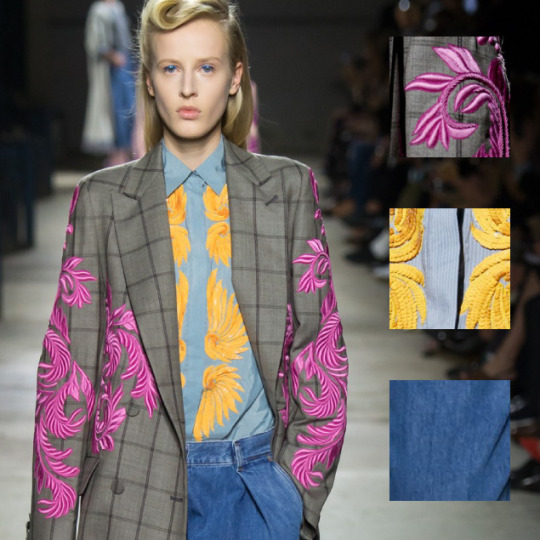 Some of the looks that appeared to just be styled as a “layered look” were in fact carefully constructed so that sections of shirts joined straight into the waistband of trousers, or shirt cuffs were joined directly onto blazers. On one garment, an open-ended zipper slices straight through the centre of both a shirt and a cardigan. The visual impact of this deconstruction was particularly striking on monochrome looks that played with the black and white layering of traditional formal attire, which appears to have been created with garment sections first joined horizontally, and then spliced vertically to create jagged mismatched edges. 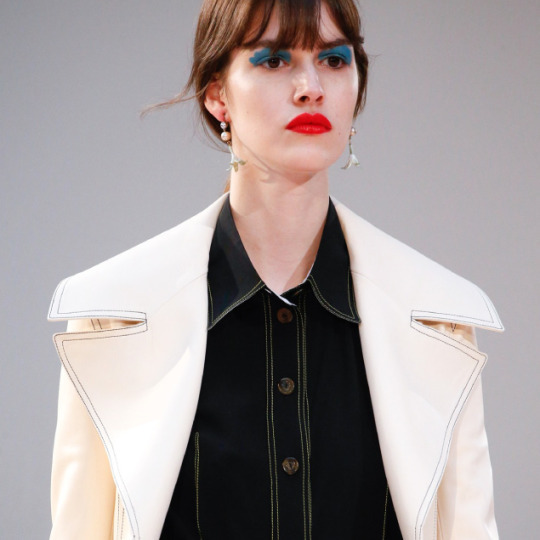 The use of angular darts and shattered panel lines mimicked the jagged shards of glass that adorned the coats and tailored pieces that closed the collection.